The summer of 1969 stands out, apart from the other 43 summers of my life that have since passed and etched impressions on my memory. 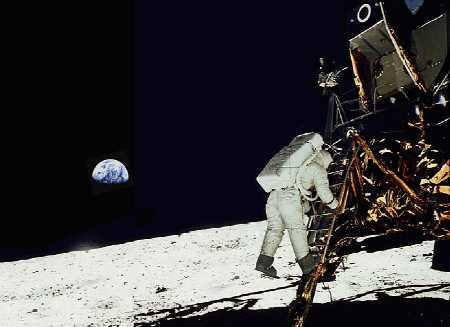 Two stand out personally: Woodstock and the Apollo 11 moon landing. 1969 had some other memorable events: Ted Kennedy's presidential aspirations went off a bridge in Chappaquiddick, the Manson murders, British troops were sent to Ireland for a few days that turned into decades. Maybe everyone feels this way about the transition year from high school to college or their college years. I think the moon walk and Woodstock were some pretty heady watershed years to bank my seminal memories on. The following excerpts are from two ebooks I am working on. The first is a narrative of growing up with the Bruce Springsteen phenomena. The second is from a memoir/nonfiction book about the moon rocks brought back from the Apollo 11 and 17 missions that are now missing. Woodstock- from "A Notion Deep Inside"
The same friend I dragged to that first Springsteen concert at the Nassau Coliseum in 1978 had been to Woodstock. He said that night [June 3, 1978] Bruce was better than anything he had seen at Woodstock. High praise indeed. I never made it to Woodstock for a number of reasons. It's funny when people I talk music with wonder why I never made it to that musical Mecca if I'm so into rock, especially rock from that era. People forget that Woodstock was expensive. Woodstock took place in August of the summer before my freshman year I college. I was getting paid menial wages for a summer job that relied on the heavy business days of the weekend. It was a health club and locker room of a high end public golf course. Prime time was early Saturday morning to late Saturday night and then early Sunday morning until late Sunday afternoon. Since the facility had to be staffed minimally during the slack weekdays, working hours were only given to the selected few who pulled the long weekend hours. That summer I was behind the eight ball in my savings for college. As the summer wound down, I still needed to save every penny for college. Earlier that summer, my family took a week's vacation at the bucolic Maine cottage of my older brother's future in-laws. I had to beg the boss for that weekend off from the health club and then promise that I wouldn't take any more days off for the summer or get fired. Fortunately for me, the Maine vacation was the weekend of the Apollo 11 moon walk so instead of waiting hand and foot on golfers, cleaning up after their mess, polishing shoes and cleaning spikes I watched Neil Armstrong make history. 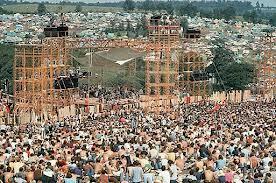 People tend to forget that originally Woodstock was not a free concert. As I remember, you could buy the three-day pass or single-day tickets. The lineup was a rock and roll who's who. Few big names were missing-the Rolling Stones, Dylan-but other than those rock icons, not many other big acts were missing. Even if you wanted to buy a single ticket, the choice of which day to pick was excruciating. The big acts were spread out. The decision became moot because the crowds just overwhelmed the fences and broke in and the famous announcement came over the sound system that declared the concert a "free concert." Magnanimous gesture, yes, practical, absolutely; nobody wanted a full scale riot of a million people. But at first, the thought of about $15.00 a day or $45.00 for the three days seemed steep. Translate that from 1972 dollars and it was one whopping price tag. A normal concert at the time cost about $4.50. Tickets at Central Park during the summer for many of the same acts cost $2.00. The argument was that $15.00 was steep but very economical for such an all-star lineup of rock and roll acts. Couple the expense of that concert plus the three days of work that I would miss, about 28 hours at $2.00 an hour, or $56.00, one giant financial hit I would take. Plus, the timing was bad because I still didn't have enough money saved for college and this was in the middle of August. I would have to lay out that money and, getting fired, not have the ability to earn another two paychecks before I'd have to leave for college. Add to the ticket price travel costs, food, gas and parking. It was the perfect storm of rotten luck and I thought that there would be more concerts just like Woodstock. I was wrong. I remember watching Johnny Carson that weekend Arlo Guthrie, who had performed and had been helicoptered interviewing out because the roads were so jammed, bubbling over with enthusiasm, almost jumping out of his seat declaring "The Thruway, is CLOSED, man." At that point, I realized I had missed the concert event of the century and also possibly the concert event of a lifetime. In a way, Bruce Springsteen made up for all that. I didn't have to lose money, starve, suffer soaked to the bone, hassle with ridiculous crowds, and put up with untold filth. Not that I wouldn't have done it. I just didn't have to put up with all that to listen to the best rock of my age. I'm reminded that "someday we'll look back and it'll all seem funny." The moon walk- from "Lost from Space"
Landmark events indelibly mark our memories and we recall years later where we were when the impression was made. I was in seventh grade when our principal, tears streaming down her face, burst into our classroom and stunned us with the news that President Kennedy had been shot. Six years later, by the time Neil Armstrong, Buzz Aldrin and Michael Collins had been strapped into their Apollo command module that Friday in July, 1969, I had probably finished tossing the last items in the family station wagon for the trip to a Maine beach house for the week. There were a number of parallels. My brother met his future wife in college as a sophomore and his fiancé's parents had a charming but Spartan cottage on a small peninsula on the southern coast of Maine near Kennebunkport, called Biddeford Pool. The oceanfront structure was separated from the surf by about 100 yards of tall, waving dune grass and walking that deserted, pristine shore line was both therapeutic and cathartic. I was either too young or had too few issues to take full advantage of the cathartic properties but a walk for a mile or two in either direction while only meeting a handful of people allowed plenty of time for thinking. I remember working at my summer job in the golf course club house and seeing the Apollo rocket lift off and then the boss barking at us to get back to work. While the astronauts were starting their 60 orbits and 240,000-mile journey to the moon, I was working my last day before going home, sleeping, and putting the finishing touches on the vacation packing. To get to Maine was a process of deciding what to take without overloading the family Chevy; all five of us and everybody's stuff had to fit, allowing for everyone's comfort over an 8-hour drive. We were travelling into the unknown; we had never before stayed in a tiny Maine beach house. The journey was smooth but cramped and we were delighted by the sight of the cute red cottage and the chance to stretch our legs, the drive made longer by the excitement of anticipation. The entrance door opened into the tiniest of foyers and immediately into the galley kitchen with a counter open to a small dining room that transitioned into a Lilliputian living room, a fireplace anchoring the far end. On one side of the knotty pine-paneled room was a large window that displayed the ocean and dunes as a neatly detailed picture. On the small table, just to the side of the window, a tiny black and white television set with rabbit ear antennae stared back at us. I didn't recall ever seeing TV sets that small but we were on vacation in Maine so network programming wasn't the foremost thing on our minds. Sparse technology in either the kitchen or the bathroom would be more of a problem. I recall being relieved because I knew that this rustic retreat at least had something to view the lunar landing, not sure what exactly that viewing would be. At some point, that Maine television was finally turned on and after seeing the reassuring TV spokesman, Walter Cronkite, at his table explaining things with a collection of plastic models, we settled back for what we thought would be an exciting evening of watching men finally walk on the moon. Nobody had told us, until Walter confided, that we would not "see" the landing and that once the craft touched down, the astronauts would sleep for six hours before actually getting out and walking around. We thought that this would be just like Flash Gordon. The rocket touches down, they turn off the engine, open the door, scramble down the ladder, and with space guns pointing in several directions, they take a look around. What we really got was different by huge measures. On the screen was this gray drawing of nothing, really, sometimes a vague shot of the Lunar Excursion Module (LM) with its spidery legs and other times dotted flight lines showing where they came from. These shadowy drawings were presented with a soundtrack of the radio transmissions from Houston to the LM, now descending to the lunar surface from 60 nautical miles above. For all we knew, these crude clever artworks were probably gray on color TV sets and why in the world do you use nautical miles in space? LMP: Like - AGS to PGNS align. Over. LMP: Like an AGS to PGNS align. Over. CC: Roger. We're standing by for it. CC: Eagle, Houston. You are STAY for T2. Over. LMP: Roger. STAY for T2. We thank you. CC: Tranquility Base, Houston. We recommend you exit P12. Over. CDR: Hey, Houston, that may have seemed like a very long final phase. CC: Roger. We copy. It was beautiful from here, Tranquility. Over. going to have some interesting colors to them. Over. through the simulated countdown, and we'll talk to you later. Over. The techno-geek speech was exciting. We were listening to conversations that we had no idea what was being said and, in that moment, wrapped up in probably the most dramatic exploration experience since Columbus clanked ashore wearing equipment as heavy as these astronauts. This was about as exhilarating as it could get. In comparison, none of the networks were there on San Salvador Island in the Caribbean to interview Columbus and he had no ability to twitter anyone so we'll be left guessing as to what really happened. That touchdown was stunning and exciting, a lot like few other moments that just we supposed couldn't be happening, similar to beating the Russian hockey team in 1980 but without Al Michaels yelling, "Do you believe in miracles....Yes!" Back on the moon, our guys assured us that there were no little green men and no evidence of any green cheese anywhere; we were staring out at what was called "magnificent desolation" and the endless expanses of gray, with dots of distant craters and boulders was fascinating, especially to all those viewers who thought a trip to a Maine beach was a big deal. This was heady stuff. The next day 60 percent of the world news coverage concerned the landing. The first day, we were treated to cartoon pictures and plastic models juggled by Cronkite, a bit like Andy playing with Woody and Buzz Lightyear and we were entranced. The promise of more than that type of viewing brought us back the next day when the astronauts would actually leave the vehicle on the first ever, Extra Vehicular Activity- EVA. They took hours to get dressed, longer than your high school prom date, but Armstrong eventually made it down the ladder to plant his paw print and we were riveted, watching all this unfold. The first descriptions satisfied years of pent-up curiosity and at about the 28th gray rock being described probably 30 percent of that world audience went back to the killing and famines and whatever the particular horror the day was and rest of us continued be frozen in front of the tube. I imagined that people were sitting in front of their sets like it was fourth down and inches, yelling at the coach to go for it; just pick up the damn rocks. What if something weird like a solar flare up or that monster-in-the-sand's fin could be seen? They would have had to scramble back up the ladder, get back in the LM, blast off and get out of there without having anything to bring back. That weekend, I walked the extremely wide expanses of the beach, trying to wrap my mind around what had just happened, looking for different shades of sea glass and shells, occasionally popping them into a pocket, eventually discarding the first pretty ones for even more pretty ones. I had some ideas in back of my head what I would do with them when I got back to New Jersey but they were rather vague plans, easily discarded a day after returning from vacation, when my attention was recaptured by the daily routine of working and living day to day. Eventually those highly- regarded-at-the-time objects would be located in a forgotten part of the rock garden. Where those shells were forty years later, I couldn't tell you. That was another parallel I had with Neil and Buzz but that explanation's a bit complicated. Both events, Woodstock and the moon landing, left lasting impressions that I am reminded of every time their anniversaries come up. Those events fuel my imagination and I enjoy the opportunity they give me to write about how they affect me and my outlook on life. This is rather a dictum of not "write what you know" but rather "write who you are."